This challenge was a lot of fun because although we love Italian food, my family had never even tasted cannoli. I’ve done a bit of frying, so this wasn’t a particularly nerve-wracking challenge, but it did give me a handy excuse to buy a deep-fry thermometer and a spatter screen, which will hopefully make a big difference in the quality of my fry sessions and the amount of clean-up afterwards. I made my cannoli dough several hours in advance. I had no marsala and briefly contemplated attempting mirin (since it is a sweet wine), but in the end I chose to use plain old white wine, and I used a few tablespoons over 1/2 C, enough to give me a kneadable, but not sticky, dough. The recipe didn’t specify Dutch-processed or natural cocoa powder, so I used the latter. While it hung out in the refrigerator, I made a batch of fresh ricotta to divide between my cannoli and the homemade cannelloni I decided to prepare for dinner, for the sheer synergy of it all. Thank heavens for the pasta roller attachment on my stand mixer! 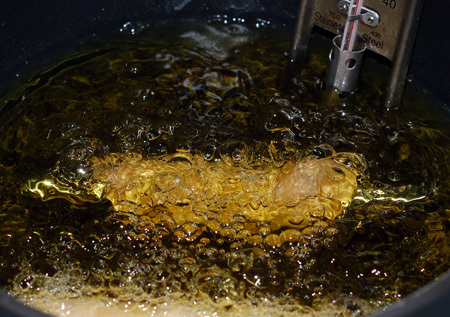 After dinner, I started heating the oil and dividing my dough into 1″ spheres. The oil was a blend of about 3:1 extra virgin olive oil to canola, partly because cannoli are Italian and I was channeling Mario Batali, and partly because I ran out of canola. 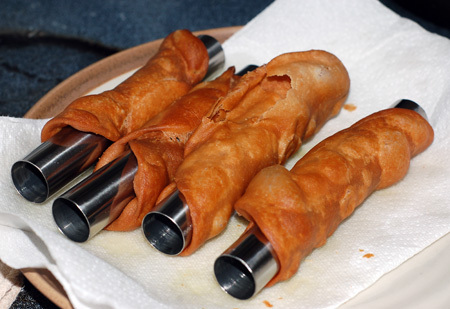 While I heated it up to about 375F in a heavy 4-quart saucepan, I rolled out my first four cannoli in the pasta roller, thinning them out to setting 6, which gave me about 5″ rounds to wrap around the forms. I had no trouble with the dough sticking to my roller or shrinking back; actually, it behaved very well and smelled delightfully of cinnamon. I fried my cannoli two at a time. The oil temperature was a little hard to keep steady; mostly it kept wanting to creep above 375F, so some of the shells got a little darker than I had planned, but none tasted burnt. 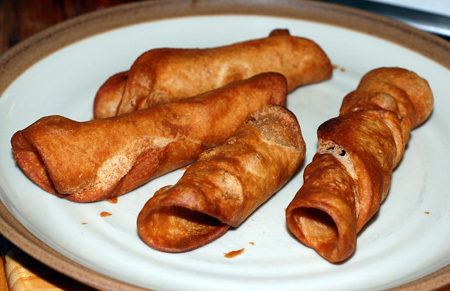 The recipe called for turning them as they fried, but mine just rolled back whatever way they wanted, so that didn’t really happen. I should also note that I never had a problem with my olive oil smoking, despite temperatures that occasionally got above 400F. While they fried, I prepared the next two forms, which went in for a bath when the first two came out to drain. I was able to carefully remove the hot forms from the hot cannoli by keeping a thin cloth in each hand and gently twisting the shell free. For the first night’s batch, I then dunked the hot forms into water to cool them quickly for the next round; they caused some spattering in subsequent frying due to water droplets inside the hollow forms, so the next night I just gave them an extra minute to cool and skipped the dunking. 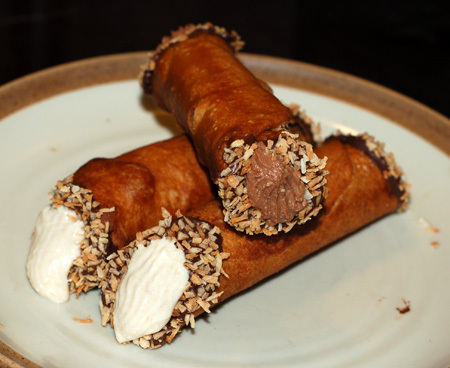 Using my pasta roller, I was able to make a dozen large (5-6″) cannoli shells with half the dough. For the most part they blistered very nicely, and I suspect that has to do with a combination of factors, namely the amount of moisture in the dough and the temperature of the dough relative to that of the oil. My shells blistered better when the oil was at least 375F and the dough was still cold. Several shells near the end of the frying session, with the dough at room temperature, almost didn’t blister at all. For the first batch of cannoli shells, I made a filling of about 1 C freshly made and drained ricotta, 4 oz cream cheese at room temperature, 1 tsp vanilla paste, and about 1/3 C sugar. It was thick and lovely, and tasted like a cheesecake. I piped it with a star tip into my cooled shells, and had just barely enough to fill the lot. Because it was so thick, I was able to fill the extra shells and keep them in the fridge overnight with very little sog factor. A few days later, I had time to fry up the other half of the cannoli dough, so I played around a bit more. Using a second batch of fresh ricotta, I made two new flavors of filling, chocolate and banana cream. Both used a base of about 1 C fresh drained ricotta and 4 oz cream cheese; the chocolate was flavored with about 1/4 C sugar and 1/2 C melted semi-sweet chocolate, while the banana cream was flavored with 1/3 C brown sugar, a pinch of cinnamon, and most of a very ripe banana. 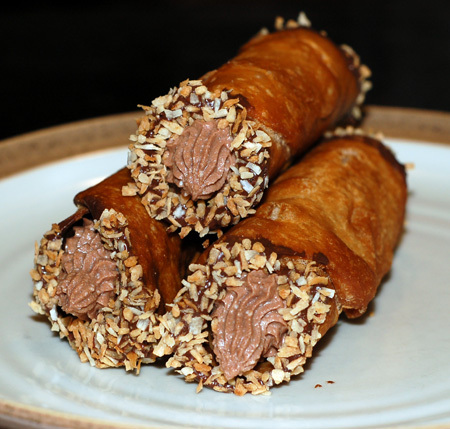 In addition, I dipped the ends of my cannoli shells into melted chocolate and toasted unsweetened coconut before filling. Both of these fillings were tasty, but the original simple vanilla filling was our family’s unanimous favorite. I should also note that the banana filling was of a moister consistency, and caused the leftover cannoli to soften considerably; I ended up deciding to save most of it to swirl through loaves of pumpkin bread. We made short work of the lot, and even our 20-month old dug in. These were a lot of fun to make, and incredibly versatile. Every variety we tried tasted great, looked elegant and impressive, and were much easier to make than expected. 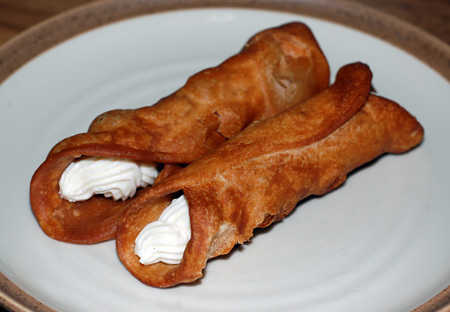 Since I can have the shells and filling ready in advance, I will definitely be making cannoli for guests in the future, and it would be fun to try savory varieties too. 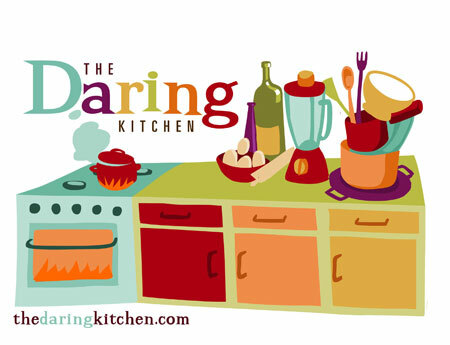 Thanks so much to Lisa Michele for choosing this recipe, and check out all of the amazing cannoli at the Daring Bakers Blogroll! 3. Oil the outside of the cannoli tubes (You only have to do this once.) Roll a dough oval from the long side around each tube/form and dab a little egg white on the dough where the edges overlap. (Avoid getting egg white on the tube, or the pastry will stick to it.) Press well to seal. Set aside to let the egg white seal dry a little. 2. 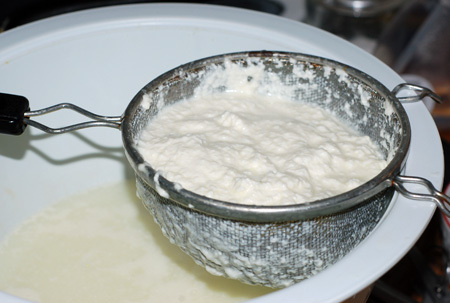 In a bowl with electric mixer, beat ricotta until smooth and creamy. Beat in confectioner’s sugar, cinnamon, vanilla and blend until smooth. Transfer to another bowl and stir in chocolate, zest and nuts. Chill until firm. 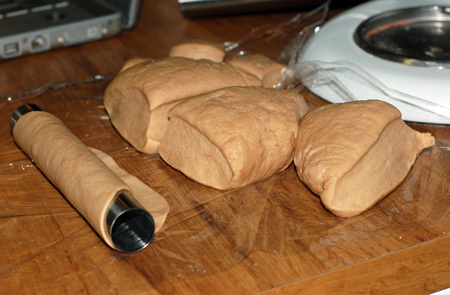 (The filling can be made up to 24 hours prior to filling the shells. Just cover and keep refrigerated). I made mine two at a time too. I found it easiest to keep them from getting overdone that way. I really like your filling choices and the toasted coconut. Fabulous job! Your cannoli look delicious & the fillings sound divine =D. Wow they all look so good and the photos are so clear and professional looking and yes the simple filling is the best for this recipe. Bravo the result speak for themself. Cheers from Audax in Australia. 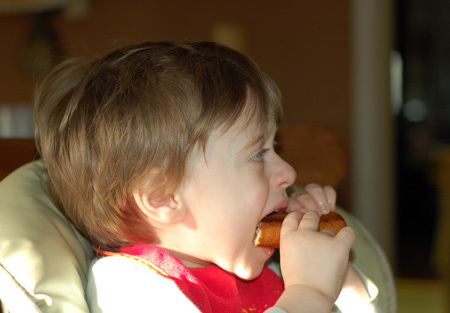 I really like the pix with the child eating the cannoli and so nice you have a recipe for dessert for friends and family. That look great! Wonderful blistering! Intersting little tidbit about the dough blistering more when it was fried cold as opposed to room temp. I’ll have to test that out! That said, gorgeous cannoli, and I’m in love with your chocolate banana cream filling..so much so, I just may have to pilfer it! Thanks so much for taking part in my challenge, you rocked it! Gosh, your cannoli are perfect. They look so yummy!